I've been using this detergent for a while now, I just really like the scent. 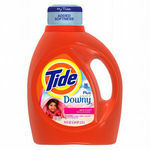 I still have to pre-wash tough spots before tossing the clothes in washer, but I'm not expexting the detergent to be magical, just as long as it foams and smells good, plus at a good price! My clothes not only smell clean. they are clean . 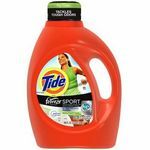 I have been buying this detergent for some time now and really love the scent. It doesn't irritate our skin, gets the stains out and is priced well! I love this detergent. Although it is not clear whether it is actually made with natural ingredients or not, I like the smell and it does the job well at an inexpensive price. Purex Natural Elements detergent is friendly on the environment and friendly on the wallet. Purex is one of the most affordable detergents on the market. Let's face it in today's economy every little bit of money you can save counts. You might only SAVE a couple bucks, but hey that's a couple more dollars you didn't have before! One of the reasons I like Purex is that it leaves your clothes smelling freshly clean. Purex washes the clothes well. It gives off enough bubbly suds to do the job. They say because of the natural ingredients that make up Purex Natural Elements Laundry Detergent, that it will less likely cause allergic reactions, which is good for people with sensitive skin toward detergents. I don't have a sensitivity to detergents, so I can't count that to be true. 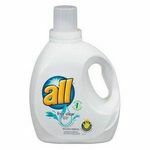 What I can say about this detergent is that it cleans the clothes well and leaves them smelling clean. My family has lots of skin allergies. It gives me amazing comfort knowing this fervent is made from plant derived materials. The scent is amazing too. A little goes a long way. I love the smell of is soap, the price is great! My fiancé has reactions to a lot of soaps but our ex doesn't bother him. Not the best from this brand. I always felt like my items weren't clean enough, sometimes my family would re-wash the load because we felt like it was clean or it just didn't do anything for the clothes but just wash off some light dirt. I guess it would be good if I was doing really light loads that weren't that dirty, like my socks and bras they don't have stains and just need to be washed a few times. It would work at that time. It's okay for sensitive skin because how light it can be and for babies as well. But I wouldn't use it for anything that is heavy duty. Performance If there was anything heavy duty like mud it just washed off but there was a stain left, with other laundry soap it would take everything off. It made my sheets and blankets rough. I always felt like I was using more then it said to use. It feels to watery and not thick, that is another reason I don't like using it on anything to big or dirty. Scent There was no scent. Not having a scent is okay for me because I don't like when the soaps have a scent and I add a fabric softener and I can't tell which smell I am smelling. I don't remember ever seeing Purex Natural Elements in the laundry isle at the grocery store but my hubby with list in hand decided found it and decided to substitute this less expensive brand of soap. Oh he did his homework, read the label, and it qualified in his opinion to give it a try. Not only was it less expensive than my brand, it was on sale, and it is a hypoallergenic product that is free of dyes and designed for sensitive skin. How could I argue with all that. Performance I have to admit that I was really surprised but it really did suds up, took a small amount of soap, did a great job of cleaning the clothes. This product is designed to be a environmental safe product. Best of all he was so proud to have found this product. Scent It really did leave a fresh clean smell to the clothes without leaving a perfume type of smell, I really liked the light airy feel and smell of the towels and sheets. Yes, this is a product that I will buy again. I bought this for my two year old daughters clothes. She has really sensitive skin and just about anything will make her break out. Luckily I found this on sale for about 2.99 a bottle on sale. I always open it to see if I like the scent, this smells really nice! I was looking for a natural product to wash her clothes with, but I also wanted something scented so her clothes smell good. This product is great, sensitive on her skin and her clothes come out smelling nice and fresh. 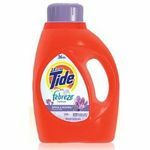 A little bit of this product goes a long way, so you don't need a bunch of it to get the clothes clean. It works great on removing food stains, dirt and even pen or marker. 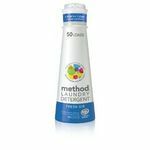 I am really glad that I found this product, because I use it for her clothes ALL the time! Performance The performance is great, it works as well as the more expensive brands. 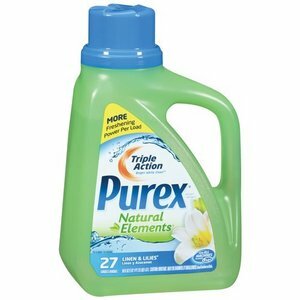 I also like the fact that it has a very strong cleaning power but it is still gentle enough to use on the most sensitive skinned people (like my two year old) so I am very grateful for this Purex natural elements laundry detergent. Scent The scent is great, very fresh and clean smelling! I definitely recommend this product.